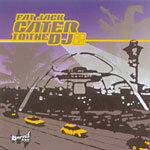 Fat Jack returns with the second installment of his Cater to the DJ series. Features most of the Battle Axe roster, Grouch & Eligh, Aceyalone, Mikah 9, Self-Jupiter, Pigeon John, Brother J (X-Clan) and many others!!! !